Voice detection has pretty much embedded itself into our day-to-day lives - millions of people have turned to AI-powered assistants like Alexa, Siri or Google to get quick answers, set-up morning alarms, read emails, control our home appliances...you name it. And we no longer even need to type messages, we just say it and the phone does the hard work for us! Natural language processing (NLP) was the catalyst in the development of voice interfaces, which have come a long way in the past few years. These days, the newest advances are taking it one step further with AI that can understand and respond to people's emotions. Currently, this is most commonly being done through facial recognition and brands are specifically using this kind of technology in advertising and data-driven marketing. Take Kelloggs for example, they are using Affectiva's emotion-detection tech to test audience reactions to their cereal ads and identify which commercial would produce the most engagement. Disney also uses similar technology for market research purposes to determine how audiences enjoy movies with an algorithm that can recognise complex facial expressions and predict upcoming emotions - they call this factorized variational autoencoders and it provides real-time accurate data for for Disney to gain better insight into what kind of content really provokes the desired emotion. When it comes to food production, machine learning reduces labour costs, product defects, and waste at the same time increasing the speed of production. Even smaller manufacturers have seen the benefits - Like Japanese cucumber farmer Makoto, who decided to use deep learning for image recognition to sort cucumbers on his family farm, an otherwise very lengthy and tricky manual process done by his mother (a pro cucumber sorter). With the use of neural networks using image recognition, he was able to automate a process that would otherwise take tedious hours of work and could only be done by someone with years of practice. Where basic machines typically only sort good product from bad product, machine learning takes it up a notch - an oddly shaped but still edible tomato typically classified as bad is usually disposed of, but with intelligent machine learning sorting, it would be recognised as suitable for the production of sauce for example. Truly optimising the process and creating less waste and energy! Music generating algorithms fall into the field of “Creative AI”, which could potentially change the future of music and the industry as we know it. Compared to the neural networks using image recognition, music algorithms are more challenging because music is subjective - there is no one definition of good music! This means the algorithm's “taste” and composition skills must be manually trained, requiring a lot of work. Regardless of the challenges, plenty of startups are trying to commercialise music composing algorithms. Actually having machines write music isn't a new phenomenon - composer Lejaren Hiller is considered to be the first person to produce a song using an electronic computer (in the 1950s). You may have also heard of the Christmas jingle written by AI back in 2016 created by computer scientists at the University of Toronto - it received quite a lot of harsh feedback for being rather creepy...but technology has come a long way since that, with forerunners like Jukebox and IBM's Watson Beat composing music that is actually hard to distinguish from music composed by humans. Although there's still a way to go before AI-powered tools are part of our general healthcare systems, providers are not shying away from investing and testing different solutions. Examples of future applications being tested already are AI-assisted surgery and virtual nursing assistants. Advances in AI for healthcare will transform both the diagnosis and treatment of diseases - amplifying the capabilities of humans but not replacing them entirely. Recently, Theresa May even pledged to revolutionise healthcare services in the UK with the deployment of AI in the NHS with the aim to prevent cancer related deaths significantly by 2033. Right now, AI is already being used to detect diseases, like breast cancer. Researchers at Houston Methodist Research Institute in Texas have developed AI software that detects early stages of cancer. With 99% accuracy, it can reliably interpret patient data into diagnostic information 30 times faster than a human doctor. Big players in the automotive industry like BMW, Volvo, and Volkswagen are all investing heavily in AI and big data. Lately media focus has been on the development of self-driving vehicles, but there are still many challenges (mostly safety and legislation related) to overcome before self-driving cars pop-up on everyone's driveways. In the meantime, there are many other ways the automotive industry is utilising Big Data. Instead of fully-automated cars, many manufacturers have developed AI based driver-assist features like automatic braking, pedestrian alerts, and collision avoidance systems. Volvo, known for its impressive safety record, is using Data to help predict when parts would fail or when vehicles need servicing, and monitoring vehicle performance during hazardous situations. They are also conducting their own research and development on autonomous vehicles data - Volvo's director of business intelligence Jan Wassen has even stated that the major contributor to road safety in the future will be autonomous vehicles. Looking for more information about how AI could be used? 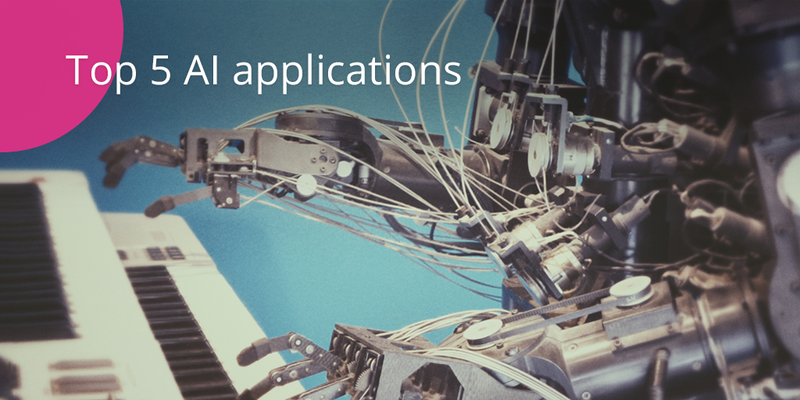 Read our whitepaper to find out more: Demystifying AI - The basics of artificial intelligence and a simple guide to getting started.